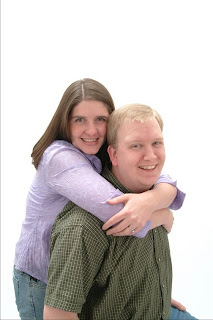 It is so hard to believe that just a short 5 years ago (Jan. 2004), Phil and I got married. And what a wonderful 5 years it has been. We started out living in Northglenn, Co. Phil was working at Blockbuster, and I at Payless. Just before we hit the one year mark, we moved in with Philips sister in Westminster, Co. She moved to Wisconsin in Feb (??) and Phils parents moved in. We stayed with them until October of that year. During that time, Phil was working full time and going to school. I sadly, had my liscence taken away for medical reasons, and therefore didn't work or do anything. It was a long year, but we are so grateful to Mom and Dad B. for letting us live with them. So at the end of October 2005, Phil got an internship at TDS Telecom in Wisconsin. So we packed up our stuff and headed out east. We stayed with Wanda again, just until we found a place of our own. On Jan1, 2006, we moved into our apartment in Mount Horeb, WI, and celebrated our 2 year just a week later. I finally got my licence back in the middle of January, and started working at Old Navy in Febuary. At the end of May, we found out that I was pregnant. (Finally!) I quite working in September (long story) and about then, Phil started school again. Orion was born in January 2007, just 3 weeks after our 3 year anniversary. In June, Phil was hired on permanently at TDS, which has been a HUGE blessing in our lives. We stayed where we were to celebrate 4 years. In May of 2008 we moved across the street (literally) into a duplex. In October, we found out that I am expecting baby number two in June. And here we are. This year to celebrate 5 wonderful years of marrige, Phil and I splurged. We dropped Orion off with Wanda for the night, and drove to Milwaukee. It was a lot harder to leave my son then I thought it would be. No tears were actually spilt, but it was close. Anyway, we drove to Milwuakee so that we could eat Chick-Fil-A. We stayed in the Radison on Lake Michagin. Phil specifically wanted that hotel, becuase it was the only that had jacuzzi tubs in the room. Those of you who know Phil, knows he loves his baths. In the 16 hours we were there, I think he took 5 baths. We also went swimming and shopping and out to dinner at Chilis. The weather turned nasty Thursday night, so we left early Friday morning, to try to beat the worst of the storm. The first 30 miles took over an hour to drive, but we finally made it home at about 1:00. It was wonderful to be able to spend all that time alone together, but I am happy to have my whole family back together. That was fun to read about the storyline of your life and remember most of it along with you. I have always thought it was neat that you and Wanda get to be such close friends. I hope to be like that with my sisters in law someday too. And I love that you drove to Milwaukee for Chick-Fil-A. Is it new there because I didn't know they had any in WI! I just found one in San Diego about 20 minutes away. I haven't been there yet but will probably make the drive sometime! Happy anniversary! Oh, and are you finding out what you are having and if so, when? I can't remember if you are a finder outer or a waiter. Happy Anniversary! You guys crack me up...driving to Milwuakee for Chick-fil-A! It seems like just yesterday you were getting married....WOW 5 years! Your hair was SO blonde! WOW! I'm so glad you posted all that so that I could catch up on your life. Five years. That's so great. We're at 5 months and I'm feeling great...I can't wait until 5 years! Orion is one lucky boy to have parents like you guys. Oh, and I think it's funny that we now know why Orion loves his baths so much...he takes after his dad! Holy Crow there's a chick-fil-a in Milwaukee??? Look out Milwaukee here I come!!! Congratulations on 5 years. Happy Anniversary!!! I really can't believe it's been 5 years. How wonderful! Happy Anniversary! Wow what a busy and exciting 5 years you guys have had together.